My results are not typical – this requires hard work & effort! If you accept the proposal below, it will cost you $0 today. If you like what I have to offer, and you decide to continue getting this groundbreaking information delivered to your every month, it will cost you $19.95 in 30 day's time ... and every month thereafter. (Cancel anytime). Back in February, I caused a bit of a ‘stir’ with my customers. I announced my 1-on-1 coaching program to my Publishing Altitude Members, and ever since that announcement -- I’ve had a literal barrage of emails about the price. After dealing with a flooded inbox from my members that needed direction in their publishing business ... I had to come up with a solution to get these life-changing lessons into people’s hands at a fraction of the 1-on-1 coaching price tag. So … I’ve come up with a solution. And it’s pretty simple really. I’ll be taking my coaching students though a process to turn their book(s) into a 6-figure business. The same process I’ve used to generate over $147,841.95 from one publishing brand in the last 12 months. Using a simple process that leverages your "existing book(s)" into another – highly profitable – income stream. Because, you’ll also get my advanced sales and marketing strategies guaranteed to grow your Amazon royalties alongside. Like I said, I want to make this a true no-brainer … with no barrier for price to stand in your way of changing your financial life this year. Inside each issue, I promise to spill the beans on how ANYONE with a book, an interest or knowledge can create a life changing income online. Insider strategies to take your existing knowledge or book(s) and LEVERAGE other platforms to make BIGGER (much bigger) profits. The simple steps to transform a SINGLE book into an information product empire consisting of MULTIPLE products you can sell for $17 - $497. How to build a 24hr sales machine in just 2 hours to sell your information product on complete AUTOPILOT. The fill in the blanks sales copy templates I use to convert more than 24% of my prospects into buyers. How to grow an email list of BUYERS and get PAID to do it – allowing you to make $1k in a SINGLE day by clicking SEND. Insider tactics to create a backend marketing funnel that allows you to grow your business on steroids and convert over 40% on additional offers that sell for BIG money. Advanced persuasion strategies to convert more prospects into sales ON AMAZON … and how to track and test conversion right on their site. Leave your competition clueless as to why your OUTSELLING them once you understand how to mind-read your customers DEEPEST needs, wants and desires. Advanced marketing & promotional techniques to propel your Kindle eBook into the top 100 of the FREE Kindle store in just 24 hours – resulting in 50+ PAID sales the next day. Walkthorough case studies of ANY tests I happen to run on Amazon Kindle and my full results REVEALED. Just let me hand-deliver it To You EVERY Month instead. 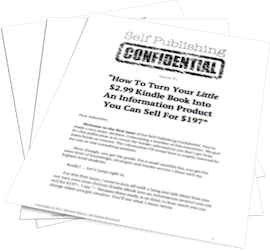 … The latest, cutting edge strategies in “Self-Publishing Confidential’ to increase your book sales on Amazon … AND … build a REAL business with your book(s) by leveraging its content into other media that you can sell for between $17 - $497. Get Access for FREE Today! Access to issue #1 of the "Self Publishing Confidential" newsletter is FREE today for your first issue. Every month thereafter, I'll conveniently bill your card $19.95 if you decide to stay a subscriber (normally $47 /month) – which is a STEAL for the insider information you’re getting access too in this brand new publication. That’s a saving of over 50%, on ALL future issues if you decide to continue with your membership. Cancel your trial before 30 days and you'll never be charged a penny. You can also cancel your subscription at any time to end your monthly billing. Every month, you hold my feet to the fire, to provide really valuable, practical how-to information and examples to explode your self-publishing business to the 6-figure mark. ... I gotta deliver the goods. Or you cancel. It’s that simple. If I fail, just put a request into my support desk and your subscription will be cancelled immediately. There are no 'back-dated' refunds on subscriptions – but you’ll no longer be billed, ok? If you cancel within your trial period however, you will never be billed so there's absolutely ZERO-RISK on your part today. I went it alone for w-a-a-a-y too long when I started building my business. ... and I'll never get that wasted time back. Hindsight is 20/20 and it burns me to think of how much further along in my business I would be if I'd had even 1/10 of the information you'll get in every monthly issue of 'Self Publishing Confidential'. Don't miss your chance to avoid my mistakes. Usually $47 /month – Today FREE! This is a newsletter trial offer. You will be billed $19.95 in 30 days (A 56% discount) and every month thereafter if you decide to continue getting these cutting-edge strategies every month. Cancel anytime. Even on day 29 – and you'll never be charged a penny.